It was a late-night, wayward adventure for a few teenaged girls who should have been at home. A 4 a.m. stop at a UDF in Pleasant Ridge to rip off some chips, cookies, energy drinks and candy. That would usually be a crime that warranted a slap on the wrist. But this one led to a high-speed police chase that ended with the 16-year-old driver slamming her car head on into a telephone pole. Fortunately, none of the five girls in the car died, but a 12-year-old suffered a serious head injury. All over a few dollars worth of junk food. This is how the police chase in July 2012 ended – a head-on collision with a pole and three teen-agers injured. That police chase, which occurred in 2012, was one of many that happen almost regularly across the region. This month, a WCPO I-Team report found that police policies on when to pursue vary widely from jurisdiction to jurisdiction. And even when police agencies do have clear policies, enforcement of them is inconsistent. READ MORE: If pursuits are one of police's 'most dangerous activities,' shouldn't policies be stricter? High-speed police pursuits are dangerous. They can range for miles. All too often, they end in serious injury, property damage, even death. Police agencies need pursuit policies that are clear about when a chase is justified , when it is not, and when a chase should be called off. A regionwide policy would be helpful because these chases often cross jurisdictions. Cincinnati Police Chief Eliot Isaac told WCPO that he would volunteer to lead such an effort. Just as importantly, the policies need to be put into practice, and enforced when they are not followed. In October, Norwood officers responded to a report of a fight. One of the suspects jumped in his car and took off. Police gave chase at up to 100 mph through the streets of Norwood. It ended when the suspect’s car struck another driven by an innocent bystander who suffered a broken wrist, dislocated shoulder, cuts to his face and glass in his eye, according to an affidavit. In February, Forest Park police tried to stop a driver for a traffic violation. He sped off and the chase reached 75 mph through Forest Park and Glendale. It ended when the suspect’s car crashed into a home on Sharon Road, causing the air conditioning unit to catch fire. In August 2016, Ohio State Patrol officers got a call about a possible drunk driver on Ohio 63 in Monroe. The driver refused to stop and the chase was on, reaching speeds of 120 mph on Interstate 75. This is one of the absurdities of some police pursuits. A suspected drunk driver who refuses to stop is then chased at high speed. When a driver is impaired, why ramp up the speed and the danger? Isn’t that inherently unsafe? 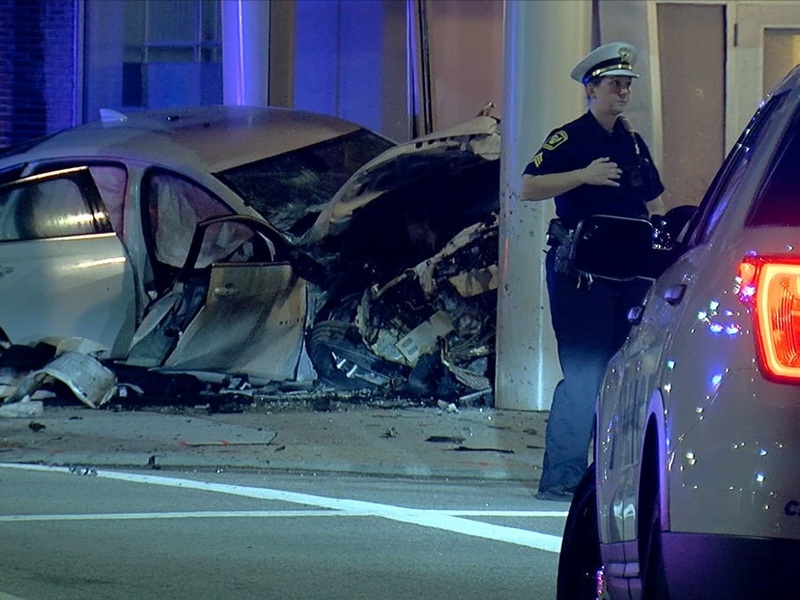 In this case, the pursuit continued for miles into downtown Dayton, Ohio, where the teen-aged driver drove over a curb and crashed. In each of these cases, it’s questionable whether a high-speed pursuit was warranted. Petty theft and traffic violations do not merit high-speed pursuits. The chase itself can turn out be far more dangerous than the original offense. This pursuit, on Oct. 8 of this year, ended when the suspect crashed into another car and then a Downtown building. One argument that’s given for chasing such minor offenders is that if word gets around that cops won’t pursue in all cases, more will run. But using license plate scanners, communications across jurisdictions, and other technology, these violators can be caught later, in a much safer way. The danger of the pursuit to the officers and the public should be less than the danger to the public if the suspect remained at large, it says. It also points out that nonviolent suspects can be identified by license plates and other methods and apprehended later without a chase. This is a common-sense, safer, rational approach to something that can place the lives of the police and the public in danger. Our region’s police departments should consider this model when reviewing and strengthening their policies on vehicle pursuits.